Ardclough will attempt to retain the Senior Hurling title that they won last year when they take on Celbridge this Saturday. IF Kildare could claim a hurling Golden Era, it would have to be the 1960’s and 1970’s. After decades of negligible impact in the small ball game, suddenly Kildare were winning titles and climbing the ranks. A Junior All-Ireland kicked it off in 1962, followed by a second four years later. The sixties finished on a high note with an Intermediate title and elevation to the Leinster Senior championship. By the middle of the next decade Kildare were making their presence felt in the province. All-Ireland B titles were also annexed in 1974 and, if you’ll allow me to include it, 1980. If any county was going to explode the monopoly of Kilkenny and Wexford in Leinster it looked like it could be Kildare. Dublin were beaten in 1976 to set up a semi-final with Wexford and Kildare entered the last ten minutes four points ahead only to be overhauled by a Yellow Belly side that went on to play a famous All Ireland final against Cork that summer. Much of that Kildare success can be directly linked to the committed efforts of Hurling Board officers such as Messrs Leyne, Regan, Campion and Tiernan. But it’s also no coincidence that this period coincided with the emergence of two rural outfits who struck up a rivalry over the guts of twenty years the like of which the county hadn’t seen since Clane and Roseberry piqued the interest in football in the early part of the century. The Kildare hurling scene had been largely dominated by Clane in the early days before several army teams and so-called turf-camp teams such as Eoghan Rua and Killinthomas started winning titles. When the Johnson brothers – Mick and younger sibling Tom – arrived in Kildare from Kilkenny, all that was set to change. Hard to believe now perhaps, but Ardclough had been a football village since the GAA club was founded in 1937, and they scaled the heights in 1949 when they overcame a star-studded Army team to win the Senior championship. Johnson, together with Laois man Mick Houlihan and locals such as Patrick “Sonny” O’Connor, set up the hurling club in 1948. Many of the footballers also threw in their lot with the hurlers and in later years that included the famous Kieran O’Malley. They were Junior champions within a year but had a yo-yo existence between the grades for the next decade, winning the Junior crowns of 1954 and 1959 and reaching a senior final in between in 1955, losing to St. Barbara’s (the Artillery team). Tom Johnson, meanwhile, had moved to Prosperous and in 1955, Eire Óg hurling club was born to serve the Caragh/Prosperous area. The hurling scene would never be the same again. Between 1965 and 1983 the two sides met twelve times in senior finals including a remarkable nine in a row from 1965 onwards. And if you think Mayo have had to show resilience and patience in football of late, spare a thought for Ardclough. Another defence forces outfit denied them a breakthrough in 1962 when Military College were convincing twelve-point winners. Éire Óg, on the other hand, developed the winning knack a lot quicker. They appeared in their first final in 1964 and comfortably saw off Athy, a win that instigated a four-in-a-row. The first of those nine finals against Ardclough in 1965 was a tough affair with a player sent-off from each side. Luck was not on Ardclough’s side, though. They had to start without two latecomers including Oliver Gough the former Kilkenny star, although he was influential when he did arrive. Tommy “Washer” Christian had to depart injured. Pat Dunny was Éire Óg’s star – not for the first or last time – as they ran out winners by 4-4 to 2-4 with midfielders Bobby Burke and Mick Dwane goaling for Ardclough. They lost the next two finals as well to their new rivals, falling by seven and then six points as the champions continued to keep them at arm’s length. Both finals were characterised by hard-tackling and ferocious midfield battles with Burke and Christian holding their own on each occasion. But Éire Óg were always the more clinical finishers. Finally, in 1968, it was Ardclough’s turn. With Ned Walsh, an import from Wexford, keeping Dunny relatively quiet and Noel Burke leading a defence that only conceded 1-2 from play, this was a different Ardclough. Their attacking play had improved as well and there was no disputing their 2-12 to 3-3 victory. When Christian, playing in his fifth final having lined out as a teenager in 1962, was presented the Seán Carey trophy he quipped “…at last. I’ve been looking at it long enough”. He then handed the trophy to founder and club chairman, Johnson, whose son, also Michael, played a great game in the half-back line. Little did Christian or Ardclough know it but Éire Óg were far from finished and 1968 proved little more than a hiatus. Raheens’ sister club reeled off another four successive final wins over the Cloughs after that one defeat. Indeed, the 1969 and 1970 finals were annihilations with margins of eighteen and thirteen points. Having supplied seven members of the All Ireland Intermediate winning side a few months before, it’s hard to understand what happened to Ardclough in the 1969 final. Two goals from John Sharpe helped Éire Óg to a twelve-point half-time lead and there was no way back for the mis-firing champions, even before the sending-off of substitute ‘keeper Jimmy Dunne. Incidentally, Peter “Red” Connolly, the Éire Óg captain, was credited that day as becoming the first man to wear protective headgear in a match in Kildare. 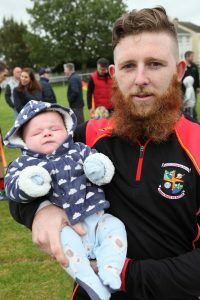 The next generation of Ardclough stars, current player Mark Lynan Snr, with his son, Mark Jnr. Ardclough had imported sharp-shooter Johnny Walsh, Ned’s brother, by the time of the 1970 final but Éire Óg completely dominated a “rough-house, brawling match that was frequently interrupted by fist-fighting”. Clearly the teams had gotten to know each other rather well by then. Éire Óg’s dominance wasn’t quite as pronounced in the next two finals but they still had enough to spare to move onto seven wins in eight years against their frustrated rivals. Finally, Ardclough asserted themselves in the 1973 decider. Another rough encounter saw Christian taken off with a nasty facial injury, but Galway-born Bobby Burke was instrumental in creating two goals for full-forward Tim Guiney and grabbed a third himself as the Cloughs emerged nine-point winners over a strangely listless Éire Óg. Finally, the pattern was broken, and even more so in 1974 when the teams met at the semi-final stage. Ardclough again held the upper hand and qualified for a novel final against Suncroft, rank outsiders who had won the Junior title the year before. Ardclough had beaten their opponents earlier in the competition (run on a league system that year) and indeed three times that season in all, but Suncroft marked tightly, led by veteran Don O’Keeffe while Frank Fogarty held the dangerous Johnny Walsh scoreless from play. The underdogs pinched four goals on their relatively infrequent attacks while keeping a clean sheet at the other end. Ardclough were beaten by six points. Other teams might have faded away after a decade scrapping for the top honours but Ardclough were made of sterner stuff. 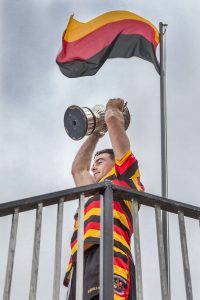 They embarked on a run of seven titles in nine years beating a variety of opposition as Éire Óg faded a little into the background. First, they exacted revenge on Suncroft in emphatic fashion in 1975, putting seven goals past them and a year later newcomers St. Brigid’s from Kildare lost a close-run final by just two points with goals from the two Walsh’s pivotal. Éire Óg came back to haunt them in 1977 on a day when two Johnson cousins featured on each team. Jimmy “Sticks” Murphy plundered two goals as the champions were edged out by three points. Brigid’s claimed their one and only title the following year and Cloughs seemed to be fading. Nonsense. They were only grabbing their second wind and embarked on a five-in-a-row from 1979 to 1983 with Leixlip, Brigid’s (twice), Éire Óg and an emerging Castledermot side, lead by Greg Deering, all vanquished. Christian and Burke were still stalwarts in the 1983 winning team, which included celebrated footballers Denis Dalton of Kildare and Pat McCarthy of Kerry and Kildare. They failed to reach the final for the first time since 1964 the following year but were back for another title win in 1985, beating Castledermot by two points. The final stand came in 1986 when Leixlip won by five points to record their only title to date. It would be eighteen years before a new Ardclough team reigned again in Kildare (and indeed Leinster where they were crowned Intermediate champions in 2006). The individual statistics are remarkable. The team that played Leixlip boasted 81 senior winning medals with five reserves claiming 33 more. Christian was a goal scorer that day in what was his 23rd final having appeared in every single decider since 1962. Bobby Burke, who sadly passed away around this time last year, joined Christian in 20 finals from 1962 to 1983, while Mick Dwane only missed one during that period through injury, but was back for the 1985 final. Richie Cullen played his first final in 1966 as a 16-year old and was full-back in the 1986 final. Relative late-comer Johnny Walsh was 45 at the time of the Leixlip match according to the match programme. Not content with Kildare successes the Cloughs embraced the new provincial club competitions in the 1970’s. In those days Kildare clubs played in the Senior competitions. A last-minute goal from a ’70 denied them a win over Dublin’s St. Vincent’s in 1976 but the following year they achieved arguably their most famous success when the two Walsh’s led a second-half comeback against the star-studded Buffer’s Alley of Wexford as they ran out 0-10 to 0-9 winners. Sadly, Kilkenny’s James Stephens halted their gallop in the next round. Of course, any successful Kildare county teams were back-boned by the combined might of Ardclough and Éire Óg during their hey-day. Kieran O’Malley was on the 1962 junior team that won the first All-Ireland for the county in three decades while John Dunne, Pat Gleeson and Oliver Kenny were on the panel. 1966 saw Colm O’Malley, Burke, Christian and Dwane help Kildare to another title at that level. All four were on board three years later when the Intermediate title was won with John Cummins and Johnny Walsh also playing in that campaign. In 1974, Cullen, Dwane, Ned Walsh and both Burkes won All-Ireland B medals while Christian and Seamus Butler played earlier games. Dom Maguire was captain of the 1980 All-Ireland B winners while Cullen, Bryan, both Walsh’s, Tom Johnson and Joe Tompkins were also on board. Christian’s county career stretched from 1963 to 1980 while Bobby Burke’s went from 1964 to 1978. Cullen, Dwane and the Walsh’s also had long stints in the white jersey. Incredible longevity all round. Ardclough Senior Hurling team with their supporters and coaches. It’s a remarkable story of resilience and perseverance. There’s no doubt Éire Óg’s success pushed Ardclough on and vice versa. That and the Johnson family ties that bound and divided them. One thing’s for sure. The latest batch from the small village near Celbridge are showing the same spirit and desire to beat the odds these last two years. Just ask Naas. Their local rivals have been warned!